Like something out of a a Neal Stephenson novel. Those of you who have read Neal Stephenson's Crytonomicon may remember the side tale of Randy Waterhouse's molars. A lot of the fun of a Stephenson novel is not the plot but the side expositions on everything from number theory to Cap'n Crunch. This is perhaps doubly true of Cryptonomicon, whose plot is only so-so (hunting for Nazi gold, sort of) but whose prose and exposition are fantastic. Anyway, in that story, one of the main characters has a problem with these horrible wisdom teeth that are impacted so deeply in his skull that oral surgeons have to run out and have 2-3 cocktails to overcome the shivers of malpractice fear they get from just looking at the x-rays. Fun exaggeration in the service of fiction, until we took my daughter to the dentist yesterday. My daughter already has a history of weird teeth. She had to have oral surgery before she was 10 to remove a baby tooth that somehow never emerged and was up deep in her head somewhere, upside down or sideways or something. So anyway, she still has 8 baby teeth in her head past their expiration date, and the orthodontist finally insisted they had to be removed. No problem. Baby teeth are a layup to remove. Fifty bucks each says the dentist (which caused us to give our daughter a financial incentive -- we told her if she could wiggle them out beforehand, we would pay her half, which she did with two). Anyway, baby teeth are easy, no big roots, nature wants them out at this point anyway, etc. And most of them were just that -- easy. Except for one. The dentist simply could not get it out. The appointment went on and on, because the dentist kept running back to the x-ray to make sure she was really pulling on a baby tooth and not some adult tooth. Anyway, it eventually came out, after much pain and suffering on my daughter's part. 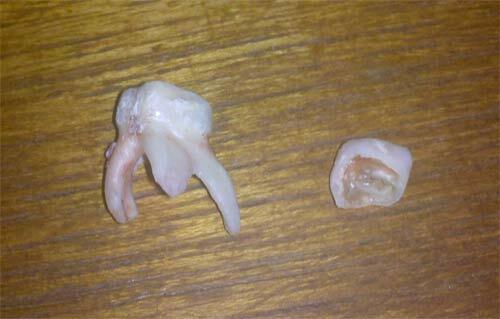 One of her "normal" removed baby molars is on the right for comparison. The Ripley's tooth is on the left. It just sort of looks evil.